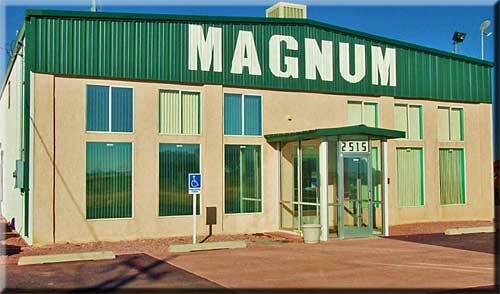 Magnum Steel Buildings has a rich history in steel building construction. Founded in 1985 and located in Moriarty, New Mexico, the firm has constructed steel buildings of all kinds throughout the State of New Mexico. Magnum Steel Buildings is also extensively involved in community service and environmental sustainability. Our firm has been an executive committee member of the Estancia Valley Economic Development Association (EVEDA) since 2003 and provides a full floor of office and conference space for EVEDA at no cost at our Moriarty location. We also support the Moriarty Chamber of Commerce and received the Chamber's 2002 Business of the Year Award. David Tixier received the 2008 Public Servant of the Year Award at the Annual Governors Economic Development Conference in Tucumcari, NM. Since 1990, the steel industry has reduced its CO2 emissions by more than 20%. Steel does not contribute to indoor air pollution by off-gassing or releasing chemicals into the indoor atmosphere. Steel is readily reused and/or recycled when buildings are demolished. Structural members are available that include thermal breaks, making steel more energy efficient than wood. Combined with our other environmentally-conscious practices, steel construction allows Magnum Steel Buildings to provide green building services to help make sure our customers' projects are both economical and ecologically friendly.